Small fish have the capacity to end hunger and boost nutrition in some of the poorest and driest regions of the world, according to a report on fisheries in sub-Saharan Africa’s drylands. The report documents the resilience of fish resources to climatic variability in sub-Saharan Africa (SSA) and the underestimation of fish and fisheries when it comes to livelihoods, Felix Marttin, fishery resources officer at FAO fisheries and aquaculture department, Rome, said. About 50 per cent of SSA is dominated by drylands, home to half of the population in the region. Most of these people are food insecure and depend on agriculture as their main source of livelihood, the report says. “There’s always been fishing in the drylands of sub-Saharan Africa. Local communities engage in fishing as part of mixed fishing-farming-herding livelihoods or as a seasonal fall back. Yet fisheries in the drylands of sub-Saharan Africa have often been neglected by policy makers and development agencies, who traditionally focused on crops and animal husbandry; overlooking the fish production potential of small water bodies in drylands,” Florence Poulain, fisheries and aquaculture officer at FAO and one of the authors of the study, said. According to the report, fish provide the main source of animal protein for about 200 million people in Africa. It is the cheapest form of animal protein, packed with amino acids, fats and micronutrients. Fisheries provide a direct source of livelihood to over 10 million Africans while five to ten times that number engage in the sector as a secondary activity for ensuring food security in the rural areas. So, how does one grow fish in the drylands? “Drylands are not deserts; they are arid, semi-arid and dry sub-humid areas. The main problem in these areas is not so much the aridity, but the unpredictability of the rain in time and space,” Marttin added. In fact, the fluctuating nature of most African freshwater and water bodies appears to promote fish production rather than impede it. “…fisheries should only be promoted as part of a livelihoods diversification strategy, and therefore, be conducted together with other food production activities,” Martinn told Down To Earth via mail. If managed well, water bodies in southern Africa alone can produce 1.25 million tonnes of fish, the report adds. “When water bodies dry out, fish hide upstream in river tributaries or stay in water bodies that did not dry completely. When it rains, (the) fish immediately rush back, because they know that these new, open niches have plenty of food. A single fish can lay tens of thousands of eggs. This means that while these species are barely available in drought conditions, they boom in times of good rain and are hard to overfish when in abundance,” Poulain added. According to the report, climate change will affect precipitation in Africa. The recent Fifth Assessment Report of the Intergovernmental Panel on Climate Change (IPCC) indicates that it will have a significant impact on crop production and water management systems in the continent in the coming decades. Predictions suggest that differences in precipitation between wet and dry seasons in Africa will widen and floods and droughts will become more prominent, intensifying seasonal fluctuations, the 2013 IPCC report says. In such a scenario where crop production can be greatly affected, fisheries can go a long way in addressing hunger needs of the population. According to one of the study authors, in addition to fishing in small water bodies, another strategy which can be explored is the stocking of rain-fed reservoirs, which is not strictly speaking aquaculture, but more like ranching. “Fisheries in rain-fed reservoirs rely on the natural productivity of freshwater systems and on restocking. There are more and more of these reservoirs which countries build to adapt to unpredicted rainfalls. This has great potential to improve human nutrition and the resilience of local population,” Poulain said. Though only 5 per cent of the world’s dams are located in SSA, thousands of small reservoirs dot the rural landscape, the report says. According to the authors, local communities are familiar with the dynamic natural environments that strongly drive fish production. However, they can benefit more from these boosting drylands with fisheries management rules and regulations adapted to traditional and highly-productive resources, as regulations are not aimed at exploiting small, fast-growing wild fish. Improvements in post-harvest processing and storage will increase the availability of fish for human nutrition and generate increased income. 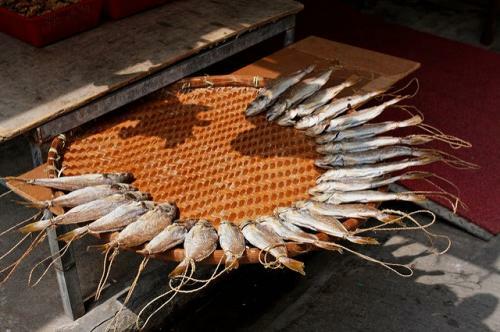 Sun-dried fish can last for years if properly stored and act as a source of food during lean and dry periods. As women are predominant in the post harvest sector, they will benefit from such interventions. Catching small fish is usually done by women and children. Though the exact contribution of fish produced in the drylands is not known, estimates demonstrate that the value is considerable. Lake Chad, for instance, is particularly important economically with fisheries providing 45 per cent of regional household income across its basin. This amounts to US $45.1 million. In addition to their contribution to national economies, small-scale fisheries play a key role in poverty alleviation and as a safety net back strategy which should not be neglected.